Following the midterm presentations as well as the intensive learning week in Montpellier, the team was able to recalibrate their previous alphabet of design parameters and create a new type of printing agenda, based on the acquired knowledge. Within the Tecnalia research trip, a new new catalog of material mixes were explored to continue perfecting the material’s density not only for printability purposes but also to enhance the material’s performative properties. Achieving increased strength, less elasticity to prevent breakage, as well as less liquid content in order to speed up the drying process when printed large scale. These new elements became design parameters, all optimized within a one wall elements printed inside IAAC. 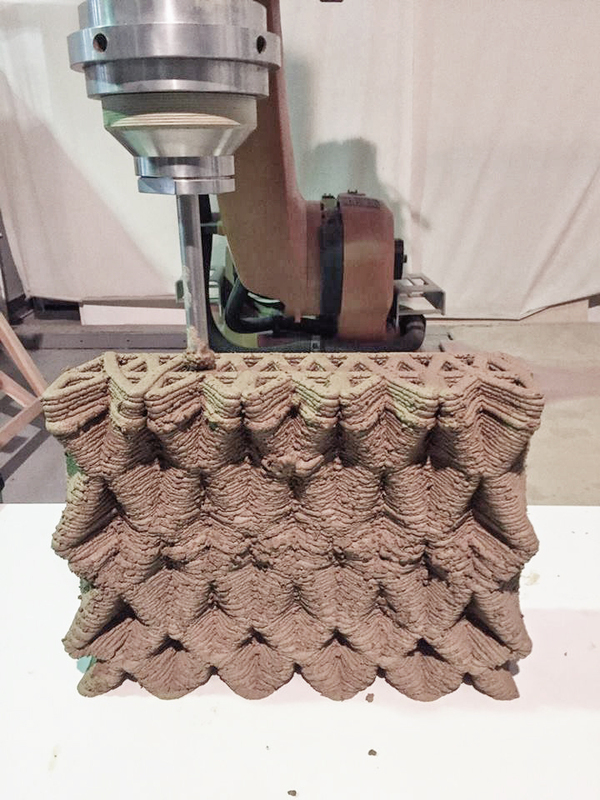 The wall presented a diagrid pattern on the facade with 3D rhomboid elements, in order to optimize self-shading, while the infill pattern incorporates performative design elements, such as the maximization of thermal properties – the infill presents heat sinks, thermal mass and thermal conductivity optimum behavior.